This post is sponsored by MirrorMate. The master bath in our home is one of those rooms that I haven’t bothered to decorate since we moved in. Yes, it’s been two years. I know that we need to do something what that big, open space, but I haven’t given it any attention. One of the things I that really wanted to do in there was to dress up our huge builder’s mirrors. My husband and I have split vanities, so that means we actually have two of those ugly things that stare at me every morning. I thought I would apply molding around the edges, like I’ve seen other people do, but I wasn’t 100% sold on the idea. The white molding I envisioned seemed too stark next to our dark cabinetry. I needed a better solution. As fate would have it, I was recently contacted by an ingenious company called MirrorMate. 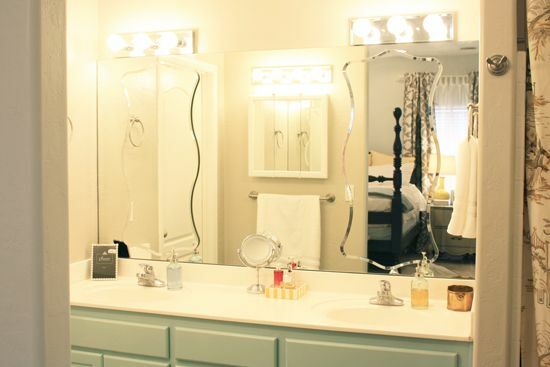 They sell custom made frames that you can apply to any existing mirror and perform a “20 minute mirror makeover.” MirrorMate offers over 15 different styles of frames, each in a range of colors. They offered to custom make a frame for my bathroom so that I could show you how quickly you can make a huge change. I believe the email I sent back to them went something like this: “Oh my. I think you have changed my life. I’d never even heard of this product, and I think it’s the most amazing thing I’ve ever seen.” Yeah, I wasn’t kidding. MirrorMate sent me a few frame samples of my choice so that I could decide which one I wanted for my bathroom. 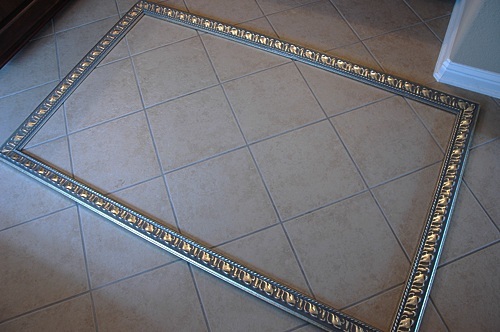 After I selected the Naples in Antique Silver, I took the measurements of my mirror and surrounding areas using their easy to follow instructions and submitted the measurements to MirrorMate. They told me that my frame would arrive at my house in about 2 weeks, so imagine my surprise when the UPS man knocked on my door just 5 days later! 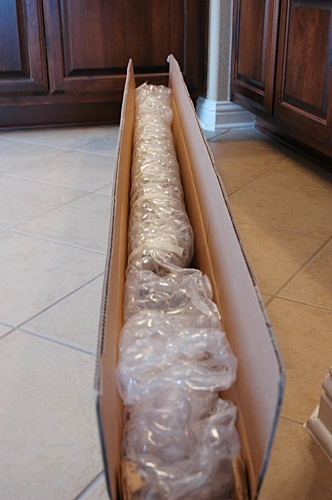 The frame was shipped in four different pieces in a long box. As you can see, each piece was bubble wrapped to ensure it’s protection. After unwrapping each piece, I found that I had an instruction sheet and the other tools necessary to complete the frame assembly. I was delighted to find out that I needed no tools for the installation other than a screwdriver, which I had to use to easily replace the huge mirror clips the builder installed with the slimmer ones MirrorMate provided (not everyone will have to replace their existing clips). 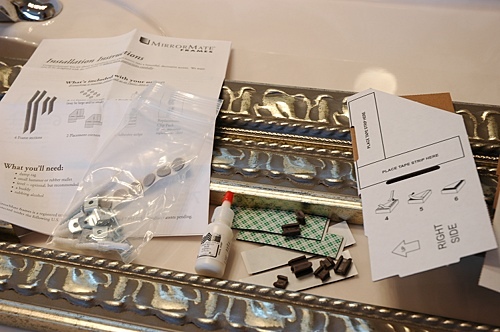 Following the directions, I assembled the frame on the floor using the glue and those little brown connector pieces you see in the above picture. I left it lay flat for an hour so that the glue could dry. An hour later, it was ready to install. With my husband’s help, I moved the lightweight frame up to my mirror and figured out the proper placement. Once I was satisfied with the placement, I simply peeled off the backing from the sticky pieces on the back of the frame and stuck it to my existing mirror. At that point, all I had to do was sit back and enjoy my new MirrorMate frame. The assembly and installation (minus the time waiting for the glue to dry) really did only take 20 minutes! Impressive what you can do in 20 minutes, huh? I really can’t begin to explain how much I love this frame. Every time I walk into my bathroom, I feel like I’m at a really pricey hotel or something. The funny thing is that this mirror frame cost less than I would have spent for a night in that same pricey hotel. My mirror frame, which is quite large at 67″ wide and 42″ tall, would have cost me under $200 to purchase. For a custom look, that is incredibly inexpensive! To make it even more inexpensive, MirrorMate is offering a 15% discount to my readers through December 2010. Yes, you read that right – DECEMBER 2010. Simply use the code HOUSE at checkout. 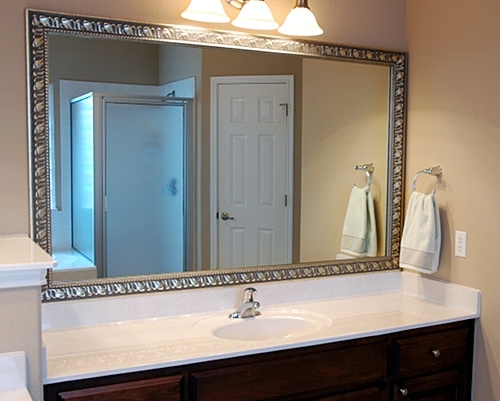 I am definitely ordering a matching frame for my husband’s vanity mirror and will likely get one for the large mirror in our upstairs bathroom as well. 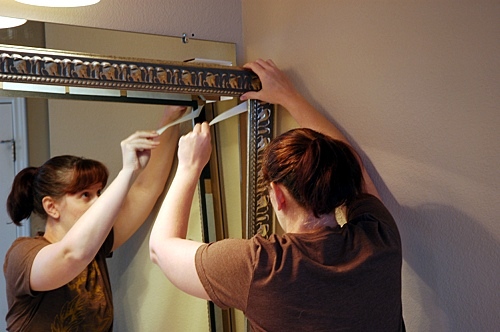 MirrorMate gets two enthusiastic thumbs up from this DIYer. Can you believe those results or what? Disclosure: MirrorMate provided this mirror frame to me free of charge for the purposes of me reviewing it for my blog. As with any review, I am stating my honest opinion and was not asked to provide a positive review in exchange for the product. I call ’em as I see ’em, folks. OH MY GOSH I need this!! My husband and I purchased crown moulding last summer to do this exact thing to my mirror and we never got around to actually putting it up. We cut the corners on angles, painted it white, and got it ready but never put the darn thing up because we were just too lazy. Personally, we didn’t want to mess with liquid nails and glue and all that. So I am marching my happy fingers over to MirrorMate and finally fixing my old master bathroom mirror! Thank you for posting about this! This might be a repeat if you read the LGN blog, but I really find that this idea is very simple (she used 3M adhesives to attach this second mirror over the original). I love the layered mirror look. That’s really cool! Thank you for sharing it! Thanks for sharing! I got on their website, I think it is great that you can choose the size of frame you want, It makes it way more custom look. I will most definitely be ordering one of these when I redo my bathroom!! I love the white molding look, but I love that 100x more!! Gorgeous!! That looks so amazing! I just love it. What an amazing company!! We have big ugly mirrors like that in both of our bathrooms. I’ve been thinking of doing something with them for a while now…and I LOVE this solution! Thanks for sharing! Thanks for posting this review – I had MirrorMate bookmarked in my shopping sites favorites folder, but hadn’t gotten around to ordering yet. Now that I see that 1) it really is easy and 2) it really does look good in a real world appliation, I’m definitely going to order frames for my two builder’s mirrors. I have to tell you about what I did which was much cheaper than mirror mate ….. I used moulding and the little square medallions for the corners ….cut all the moulding to fit and glued it up with mirror glue …..easy and adorable!!! I stole the idea from Rhoda at Southern Hospitality!!! Cool! My parents and I saw this product on HGTV last summer, and when they were getting their house ready to put on the market, they installed it in their master bathroom. It makes SUCH a difference! This has been saved in my must do folder for some time now! I originally saw this in Janell’s bathroom from Isabella and Max rooms! This looks great in your bathroom Lindsay! That made a HUGE difference. I really love it! That is awesome!! I wish companies would contact me and offer me free stuff!! How lucky of you. The mirror is amazing. I’m definitely sold. It looks AMAZING! I’m totally sold on these! It looks so great! Wow. Who knew? It looks great! Holy heck that is gorgeous. What a transformation! OH MY GOSH! This is going to solve my mirror problem! This looks amazzzzzing! So going to try this! That is awesome!! I’m bookmarking this post to come back to after finally move into our just purchased house! Love that the coupon code is good for so long!! I am totally getting one of these!!! Oh! I have a big mirror that is going in my someday master bath and I totally want to get that to go around it! Love!!! This is EXACTLY what I was thinking about for my bathroom mirrors. Thanks! Wow! The transformation is so amazing and easy. So wish I had the money to do that. Not going to happen in my Dave Ramsey, can’t justify $170 for a mirror, world, but happy for you to enjoy it! I’ve seen something similar at Lowe’s that I almost bought. After seeing your transformation I may have to do this! Thanks. I saw this on someone else’s blog too. What a transformation! If only I had the $300 plus it would cost to do our master bathroom mirror . . . .
I’ll have to file it for future reference . . . . I love that!!! It looks like 250 times better now! This is so timely as I have been contemplating a mirrormate frame for quite some time! I have bought molding, but I agree with you, white will be too stark and I will have to paint it once it is installed. I was trying to find a less expensive way to frame 4 very huge mirrors. I think I will try the mirror in my downstairs bathroom and see how it goes. Then on to the M-bath (with the 3 huge ones – vanity, and two sink areas). I’ll use the discount code 😉 (thankyou!). Looks great! It does make your bathroom look like a fancy hotel. Gotta love that! I am in awe of this before and after ! 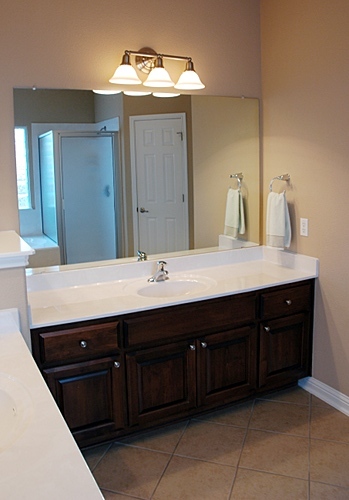 Your bathroom looks absolutely amazing ! Love the frame you chose, so elegant ! It’s all about glamour… and this mirrow now has it! Gorgeous! you did a great job Lindsay & looks like a great product too! Ummm ….. WOW!!! I’m going to that website right NOW!!! Thanks! Very cool!! I am going to have to check this out. My mirrors are ugly. BIG TIME! Lindsay, I am so excited about this project! I’m doing this in our master bath and kids bathroom! Thanks for sharing! Thanks for this great idea -I have passed it on to a few friends! I realized the frame will also hide water marks that creep up the mirrow from the back splash. I am seriously considering this to update our hall bath. I have two mirrors that I used mirror mate on. It is a very, very easy install for a custom look. The price is affordable and fortunate for me I live in the same town as the company so I picked up the frames myself to save on shipping costs. I really like mirror mate and wish I had come up with the idea myself! 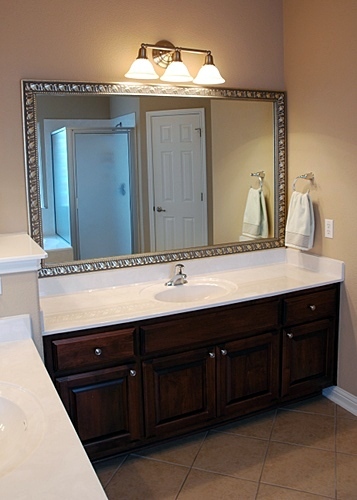 I accidentally found MirrorMate after Googling “Venetian Mirror Trim Kit.” Though MirrorMate doesn’t offer this, I’m leaving this comment hoping they will read it and offer that type of mirror trim. I have this ginormous dining room mirror that I’d love to dress up w/Venetian mirror-type trim. It would truly make a statement in my home. Tell me what you had to do with the original mirror clips before you could mount the frame. I’ve wanted to change the look and cover the water-marked bottom of my bathroom mirror. Figuring out the mechanics ahead of time is what is stopping me. Hi Lee- It was very simple. I just unscrewed the original mirror clips from my mirror and then screwed in the new ones that MirrorMate sent me. We did them one at a time and it was honestly no big deal at all! I love this! My husband creates the diftwood frames for my Glass Art. earthy feel – ie. log and tmber frame homes. This is exactly the knowledge I desired. Many thanks writing this article.